Artisan cakes from the Cotswolds. The Vanilla Pod Bakery was started by founder Pia Cato in 2009 after she won a business planning competition at university. 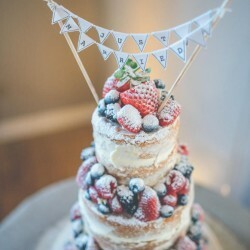 Initially starting with cupcakes the business now specialises in creating delicious bespoke wedding cakes for brides and grooms holding their wedding day in and around the Cotswolds, and celebration cakes for any event. We are now expanding to offer cakes further afeild, so everyone can get a slice. Offering a range from bespoke cakes, click and buy celebration cakes and letterbox cakes. We cater to most dietry requirements with Vegan, Gluten Free and Egg free options available. HRH Duke of York has eaten a box of The Vanilla Pod Bakery bite size cupcakes! The Vanilla Pod Bakery was also a regional finalist in both 2014 and 2015 at the Wedding Industry Awards. With many awards in the wedding industry we are an experienced team with over 30 years cake experience in our small team ensuring you get the best cake possible.